Whilst the majority of my father’s photos came to me as negatives, a number were printed, and of these some had the location written on the back. As well as the location, a few are also specific about the time of year as the photo reflects how London appears as the seasons change. 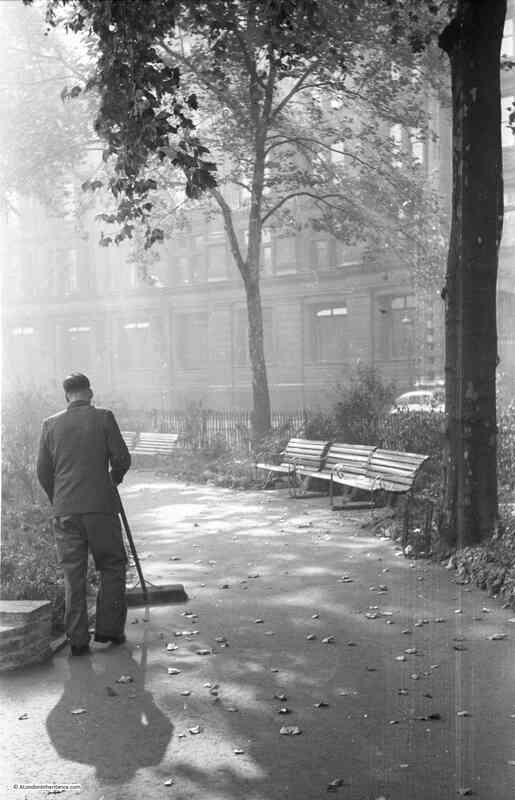 For this week’s post, I bring you two photos on which my father had written the simple title “Autumn in Finsbury Circus”. Both were taken early in the morning and show autumnal light shining through the trees, with the first autumn leaves on the path. 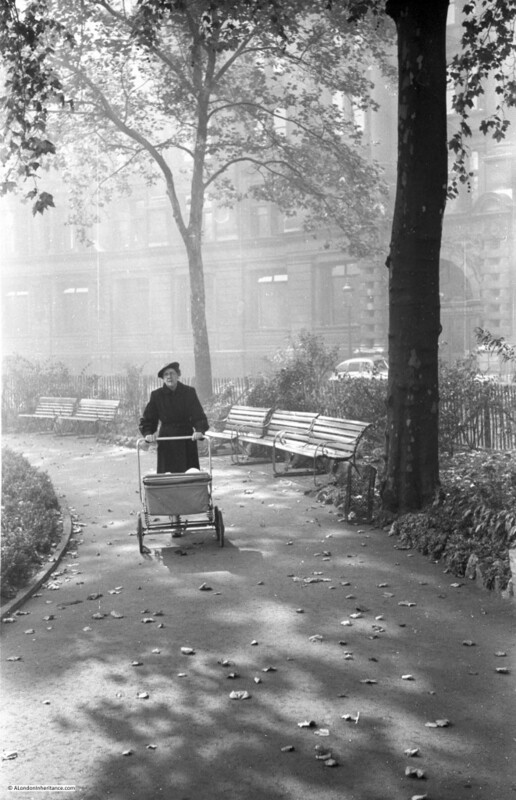 There are two photos, one showing a woman pushing what looks like a pram, whilst the second shows a man starting to sweep the fallen leaves. I suspect that he had taken these photos either for exhibition or competition at the St. Brides Institute Photographic Society as they have a more composed quality rather than the straight forward recording of London’s buildings and streets. To try and find the location of these photos, a day off from work last Friday provided the opportunity for an autumn walk around London. Finsbury Circus is much the same today, with one significant exception being that it is a major construction site for Crossrail with the centre of the gardens in the middle of the square being used for access to Crossrail and sections of the path that runs round the perimeter of the gardens also being closed. If I correctly located the buildings in the background, they were behind part of the closed off path, however parts that remain open provided the opportunity to show that not too much has changed (if you ignore the major construction site to your left). The layout of Finsbury Circus was established in the early 19th Century, with the office buildings we see today being built over the following century, with some redevelopment continuing today. As one of the few areas of green space, the gardens were very popular with city workers, with a bandstand and bowling green occupying part of the centre of the gardens. A small, temporary bandstand remains today. 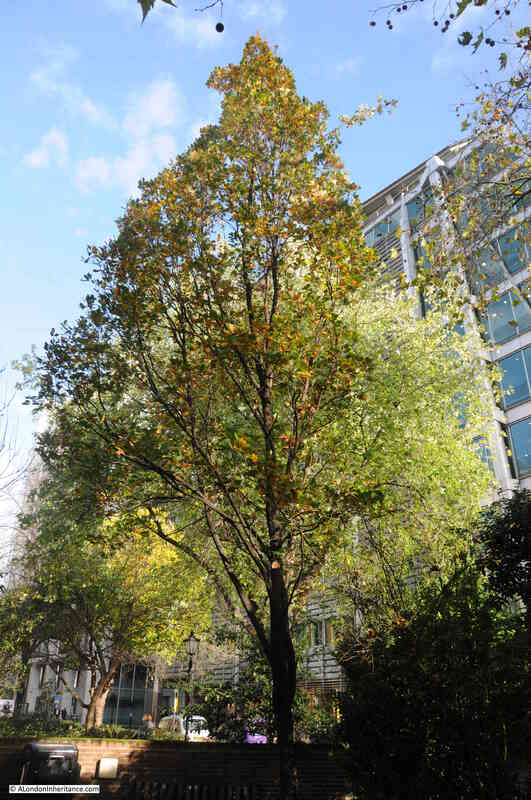 The gardens at the centre of Finsbury Circus will be restored after the Crossrail works are complete. The main entrance to the Crossrail construction site which currently occupies much of the gardens in the centre of Finsbury Circus. Walking in central London, there are very few indicators of the season of the year. Apart from temperature and the times of the rising and setting of the sun, it could be any time of year. The natural indicators of whether it is spring, summer, autumn or winter are few and far between. Taking inspiration from the title of my father’s photos, I thought it would be interesting to take a walk through the City and look for any other examples of where autumn can be found in amongst such a built environment. The weather last Friday at least was very autumnal with strong winds and alternating between heavy showers of rain and clear blue sky (although in fairness that could be English weather at any time of year). There are very few green spaces left in the City, the majority that remain are usually associated with a church, either still remaining or one that was lost in the last war, and it was to one of these that I headed to after Finsbury Circus. This is the garden that occupies the site of St. Mary Aldermanbury. a church that was heavily damaged in the last war, not rebuilt and the remains shipped to America (see my first post here). Just south of London Wall at the corner of Aldermanbury and Love Lane. A heavy rain shower as I stood in the garden, and a strong wind blowing the fallen leaves up against the far wall. The next stop was the garden that occupies the graveyard of the church of St. Anne and St. Agnes at the corner of Noble Street and Gresham Street. 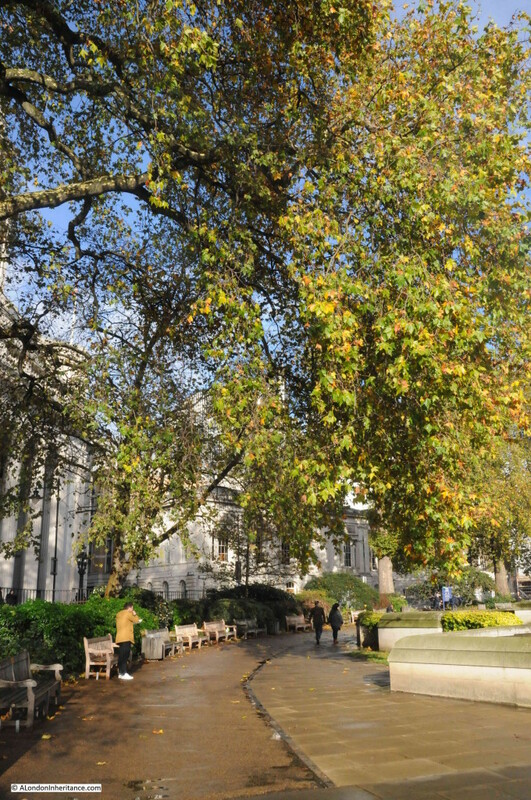 This garden occupies a relatively small space, however some mature trees reach up to the sky in amongst the surrounding buildings, with the leaves starting to turn to their autumn colours. Walking to the end of Gresham Street, then turning up St. Martin’s Le Grand I came to Postman’s Park. 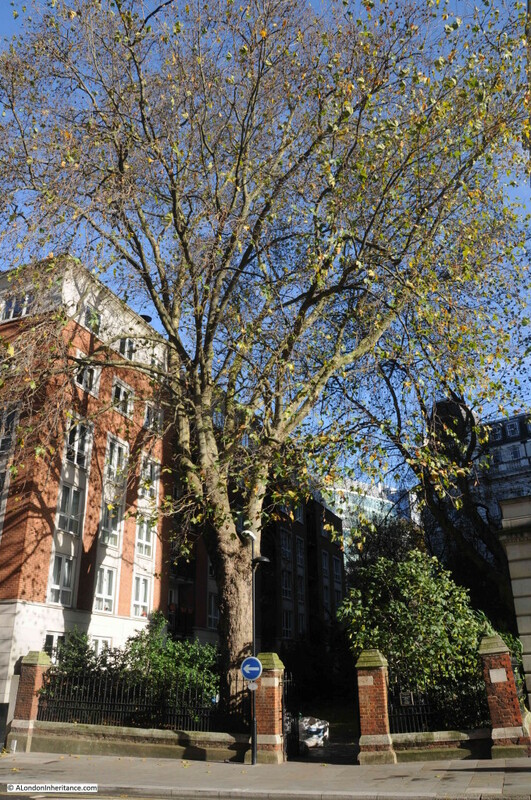 At this time of year, the sun does not reach above the buildings to the south in order to shine on Postman’s Park, so the park spends much of this time of year in shade that appears to be made darker by the sunlight on the surrounding buildings. Many of the trees here had already lost the majority of their leaves. 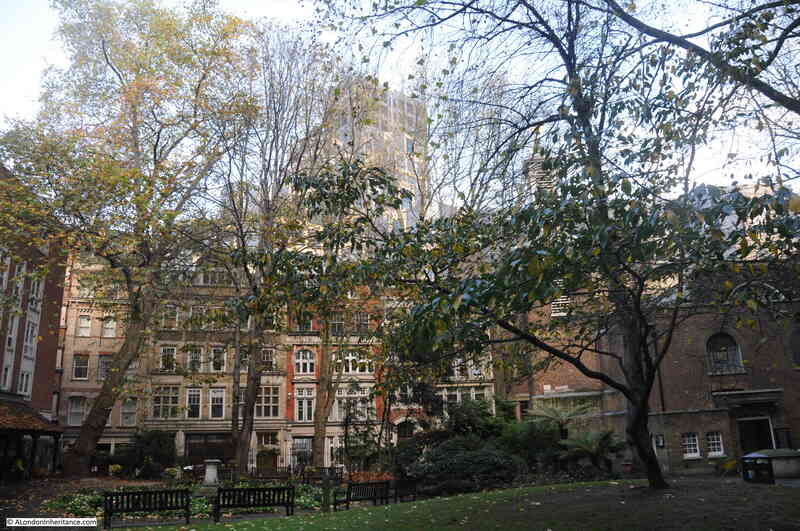 Walking out from Postman’s Park into King Edward Street and I was back in the sunshine of an autumn day. 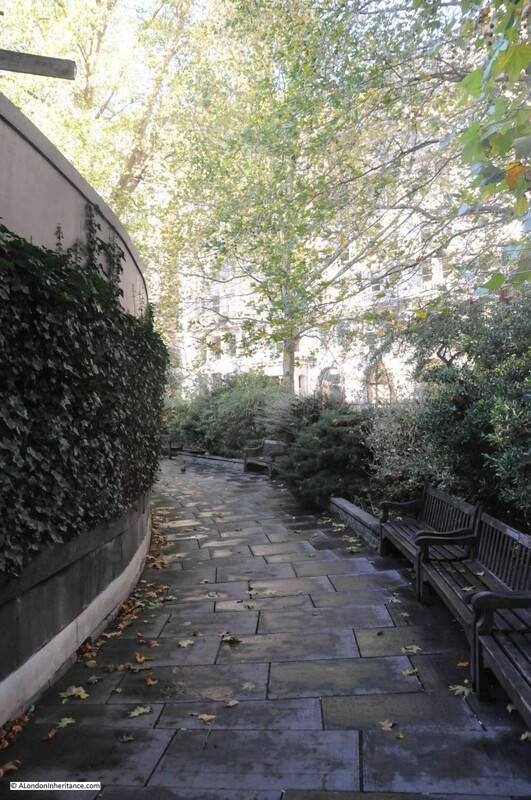 Heading south from Postman’s Park to one of the larger areas of green open space remaining in the City, the churchyard of St. Paul’s Cathedral. 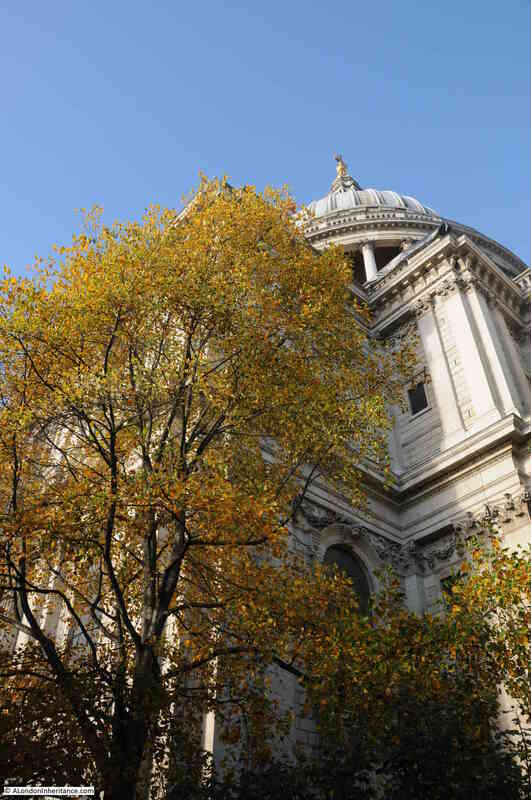 Here plenty of mature trees can be found around the eastern half of the cathedral and their autumn colours looking spectacular against both the stone of St. Paul’s and the sky. From St. Paul’s, it was then a walk down Cannon Street, Eastcheap and Great Tower Street to Trinity Square Gardens. 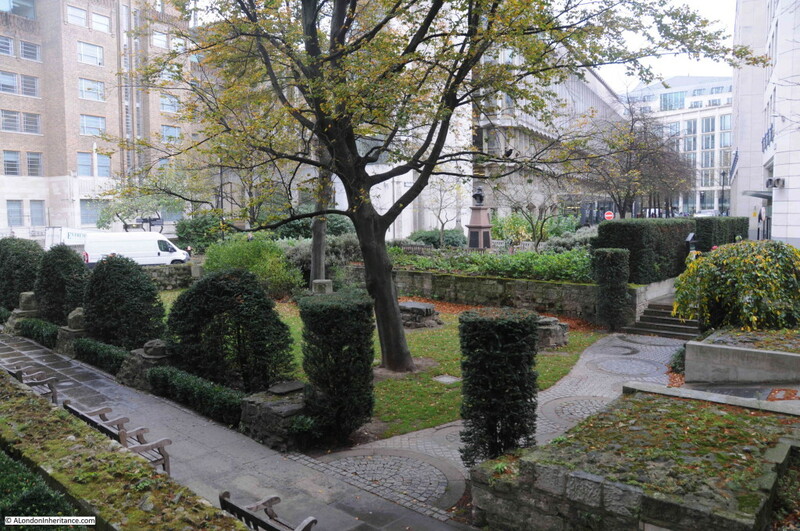 (I did miss out the garden at St. Dunstan in the East as the sky to the east was getting very dark and I wanted to get to Trinity Square before another heavy shower of rain). This large (for the City) open space also benefits from a lack of tall buildings to the south so the rare combination of a City garden that also gets the sun at this time of year. The pavements showing the signs of recent rain. Overhung by mature trees, the pavements will soon be covered by leaves. 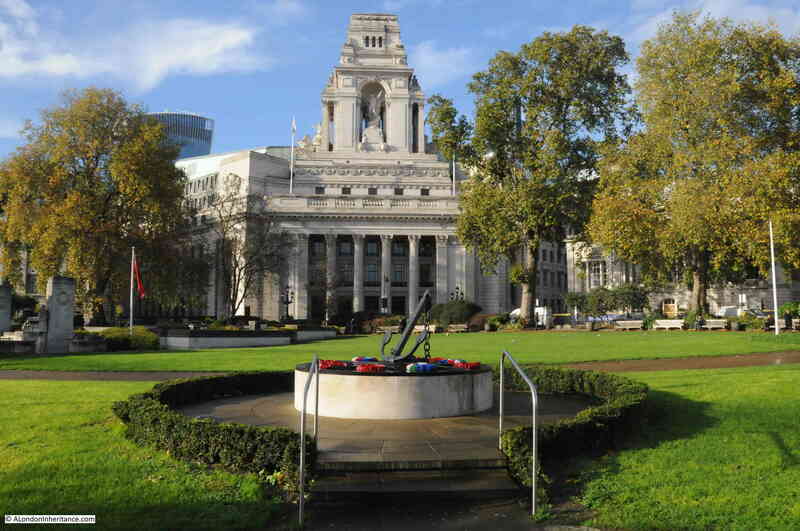 The old Port of London Authority building in the background with the new memorial to Royal Fleet Auxiliary and Merchant Seamen who lost their lives in the Falklands Campaign. 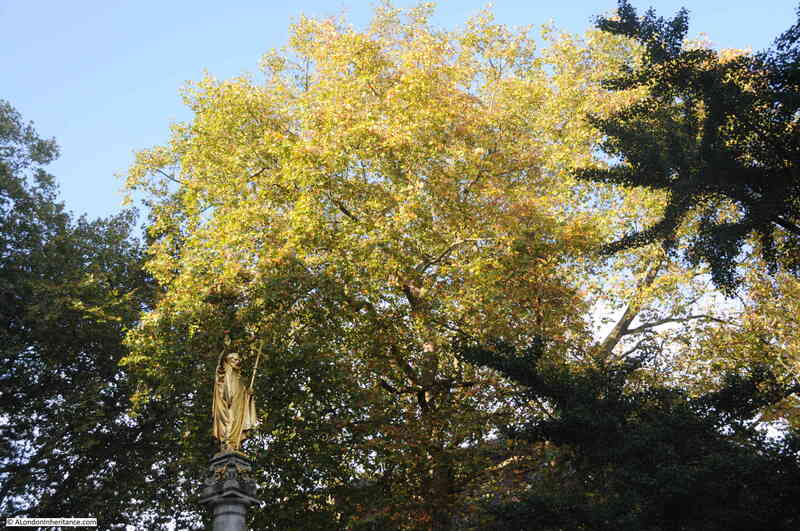 The mature trees around the edge of the gardens just starting to change to their autumn colours. 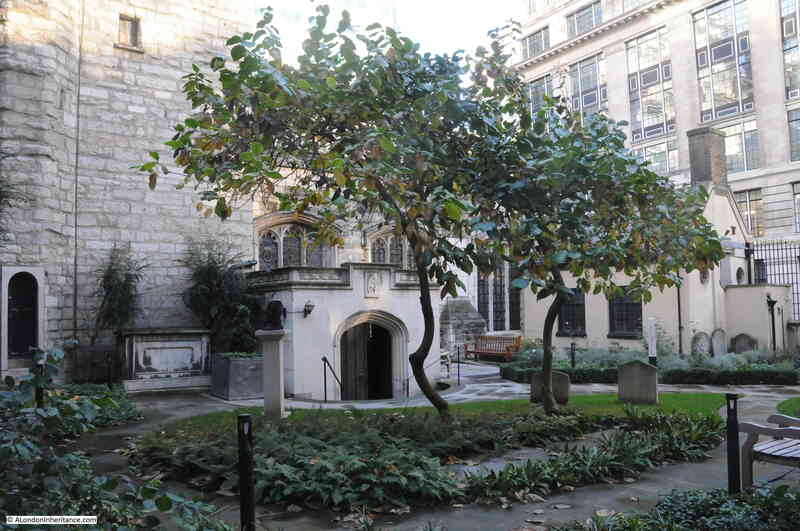 My final visit was to the churchyard of St. Olave in Seething Lane. A small churchyard just catching the last glimpse of an autumn sun, with leaves on the trees starting to fall. It was a fascinating walk through the city on a typical autumn day with extremes of weather from heavy rain showers to clear blue sky. Even with the amount of building there are still places were it is possible to observe the changing of the seasons and retain contact with the natural cycle through the year. I fear though that with the ever increasing height of buildings in the City, these valuable survivors of the natural world will be spending more and more of their days in the shadow of their surroundings. 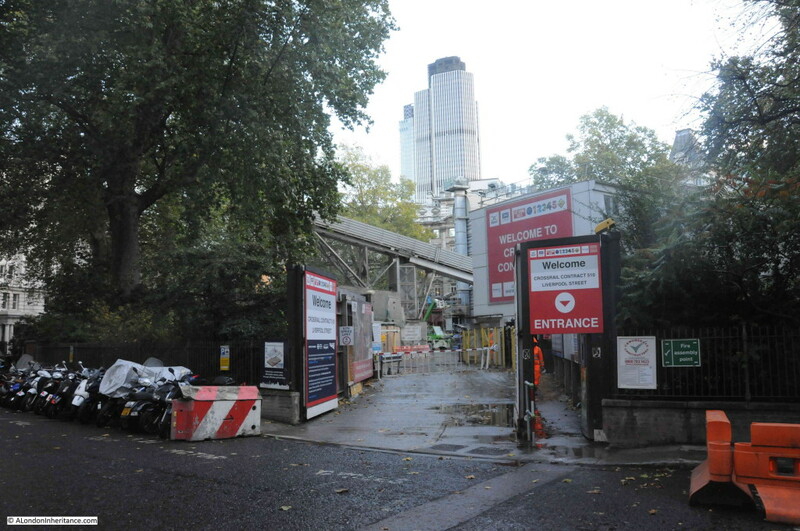 This entry was posted in London Parks and Gardens and tagged Autumn, Crossrail, Finsbury Circus, Postman's Park, St. Mary Aldermanbury, St. Paul's Cathedral, Trinity Square Gardens on November 15, 2015 by admin.